After an initial creative block, Kate and I developed the idea of a a playable tai chi structure. The overall goal is to create a whimsical experience that also forces the user to slow down (internally and physically). To acheive this, we are planning on creating, in essence, an oversized cat toy. Certain sections will be lit up with an LED strip to show where the user should place their hands or feet, (and hopefully we can get our vibra sensor to work tomorrow), so with the correct placement there could be a vibration as well. In Rhino, I made two major models of what we would ideally like our project to look like. We don't want it too geometric or "harsh", so to speak, but curves can be more difficult to produce. The first model shown is my most recent one. We pretty much definitely won't cut it or print it, but it will be useful to have a more detailed visualization of our project. In our studio, Products for Wellbeing, we looked at different ways to ease or alleviate stress, and improve wellbeing. We focused on stress because it is extremely prevelent in today's society, especially in young adults. 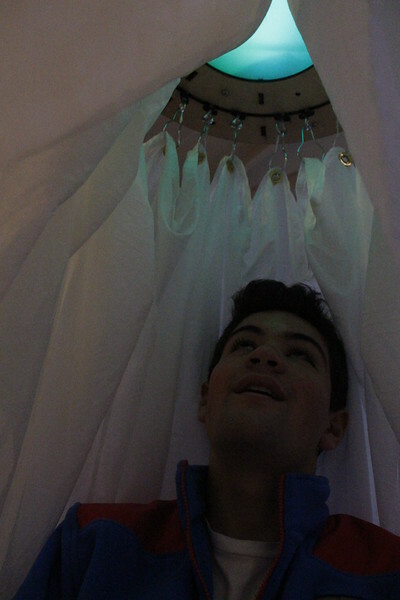 Our group decided to create a Shower of Lights, or a light cocoon to help mitigate stress. 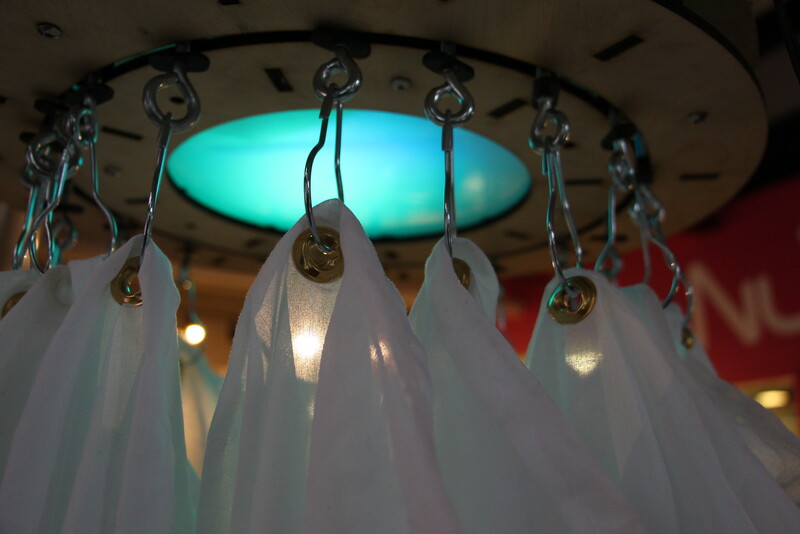 The shower of lights extracts the stressed out user from the outside world by inserting them into a light cocoon that can be used in various places such as offices, classrooms, bedrooms and other stressful areas. 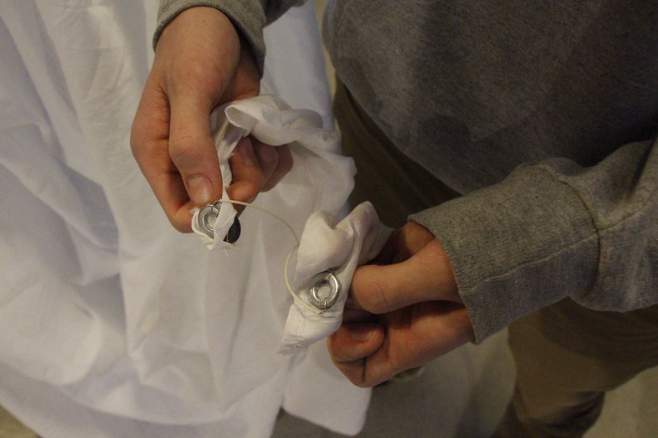 For one to achieve perfect bliss, we created a stress free way of turning on the light cocoon by connecting two magnets from the bottom of the white bed sheet together. 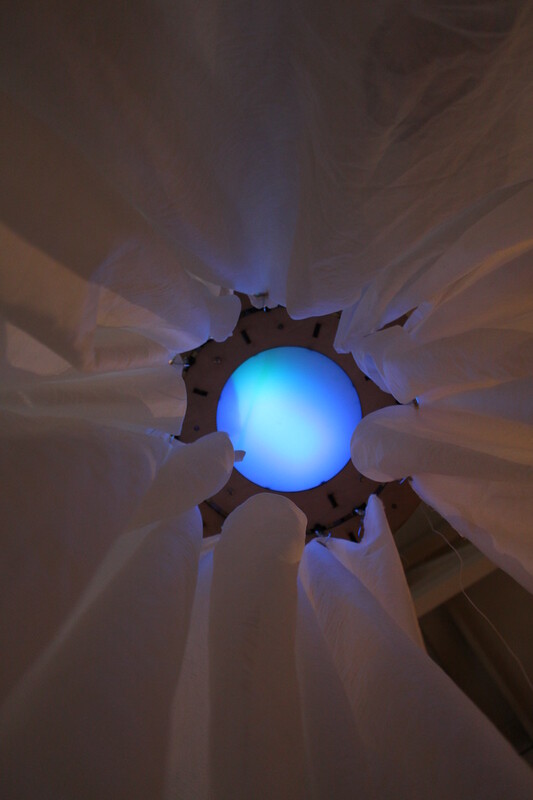 The lights in our cocoon provide an color changing scheme that is calm, mollifying, relieving, and in no way ardent. Our product is important because there a few other products that address stress reduction in a manner that is portable and attractive to young adults. No other product encompasses the ease of turning the product on, the same intricate array of therapeutic lights, or the alluring net that makes the lighting opaque, keeping the user within the cocoon. We came up with the main concept of our project after taking inspiration from bed canopies/nets often used in order to keep bugs out. 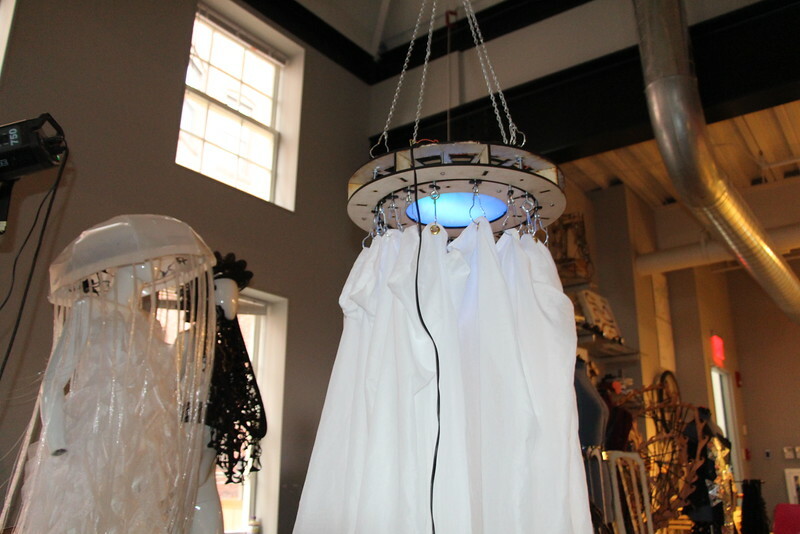 The theme of our studio was well-being, and our idea was to promote feelings of relaxation and stress relief by shining LED lights over a bed, using the canopy to keep the user immersed and mitigate any distractions from the outside. 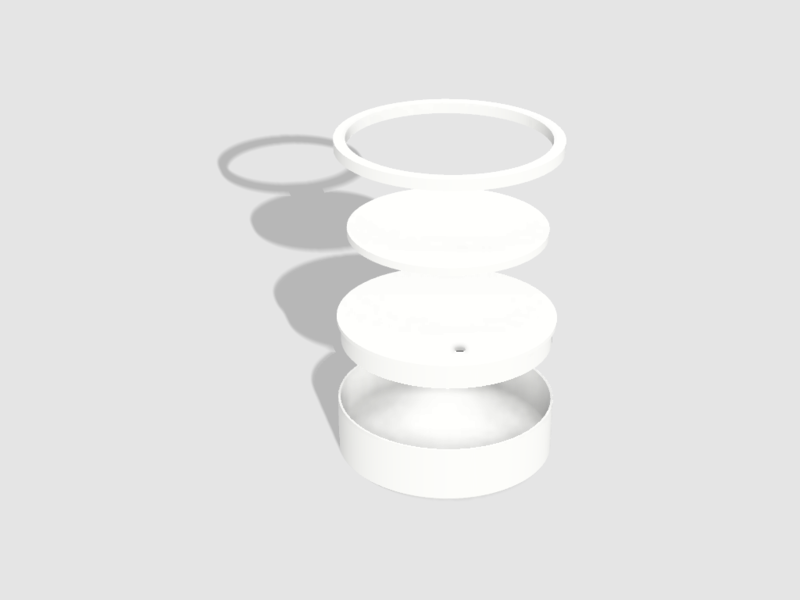 The first vision for our product was that it would hang above the bed and contain the LEDs as a circle, so we began to work on our first iteration. 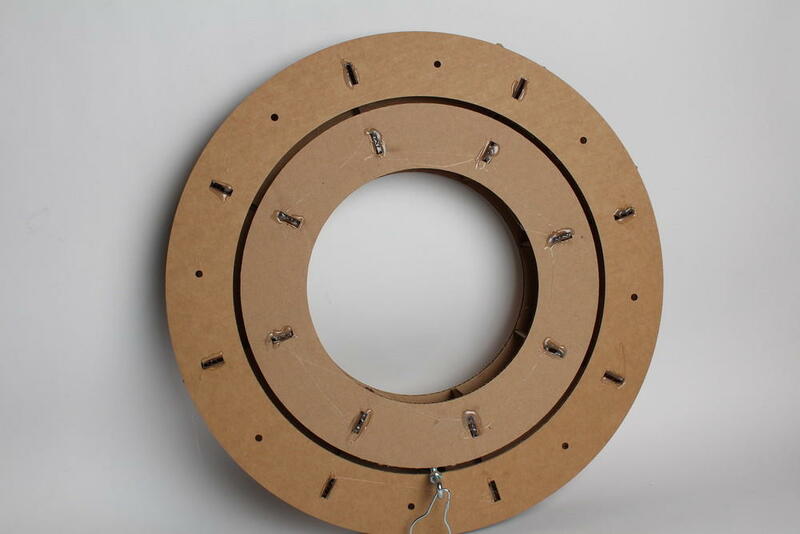 Our first iteration, a scaled down wooden circle that we had cut out with the laser printer, was elementary, but gave us a good starting point. One of our group's biggest plights was the lack of mobility that the circle gave the curtain. In order to fix this we made our second prototype, which was full scale, and made out of cardboard with the ability to rotate the curtain back and forth for easy entry and exit. We did this by connecting several pieces in order to make space for the sliding pieces to move back and forth. After a successful second iteration, we moved forward with the same design and printed it on wood as our final piece. 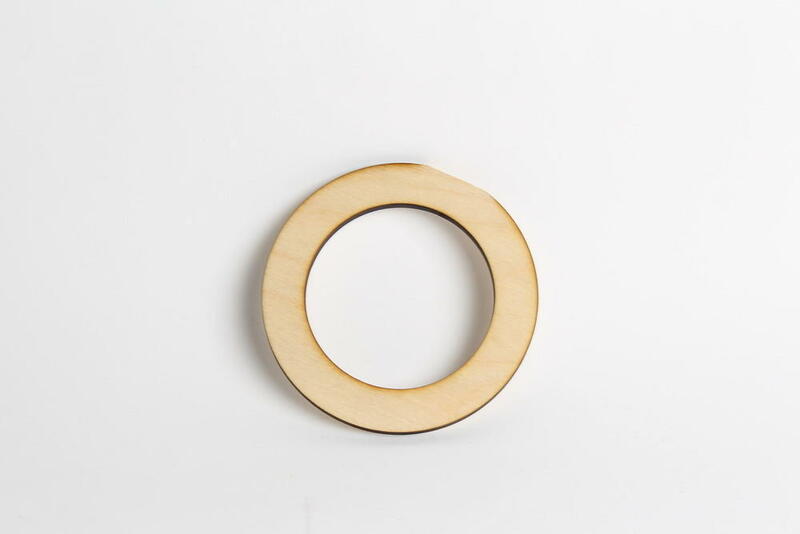 Besides printing the final on wood, the only other major differences was the creation of whole on the top ring, to keep the rings from being too heavy. Once we had our final product pieced together, we decided to market it as an environment someone could put a chair inside and sit in, rather than it being used only as a bed net. This decision was made because we were unable to get cloth in the right dimensions in order to cut it into a proper cone or tipi shape to put above a bed. 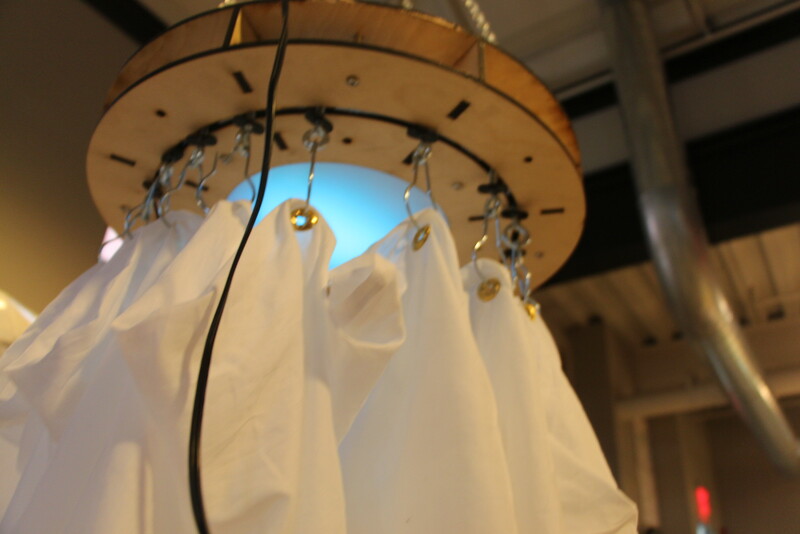 Coincidentally, we found that giving the light shower more uses, rather than just a bed net, made it a more versatile product, appealing to more users. We started out this studio interested in creating a device that would force people to take a break from work. 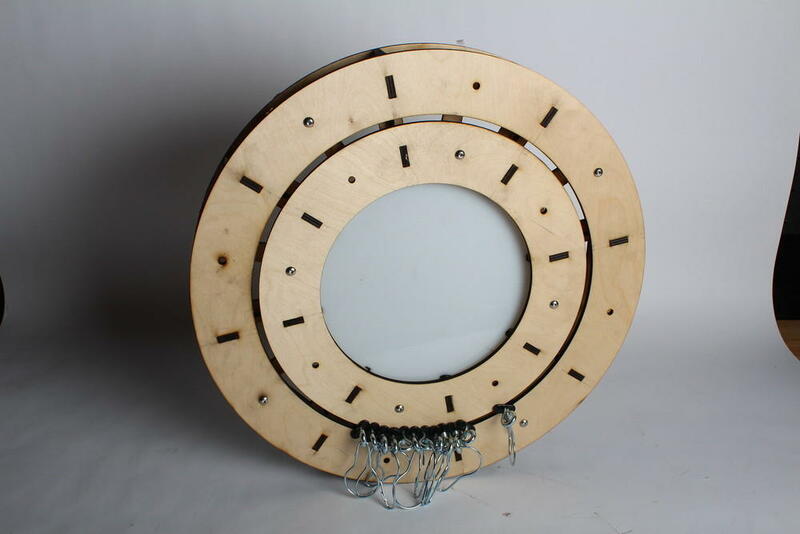 At first, we thought of something that would catapult a ball that you had to retrieve. Once the ball was flung off into space, an annoying sound would play and wouldn't stop until the ball was back into position. We kept up with this for a while, but decided that the project was too mechanical and was too shallow of a project. After brainstorming of new ways we could achieve the same goal, we decided to hit two birds with one stone. Most everyone doesn't drink enough water throughout the day. We are all guilty of it. It is an integral part of staying healthy, yet we neglect drinking water repeatedly. We decided to make a coaster that would make you drink water as well as take a break from work. The coding was fairly simple, all it needed to do was start a timer when it sensed a water bottle. After 15 or so minutes, it would glow and vibrate signalling you to take a sip. We wired the pressure sensor, LEDs, and vibration motor to an Arduino Nano and bread board but figured that it would be too thick to house in a small coaster. If the coaster is too thick, it wouldn't look very good, so we used a solderable bread board to cut down on the width. After it was wired up, we needed to make the coaster itself. The coaster itself is composed of 4 pieces. 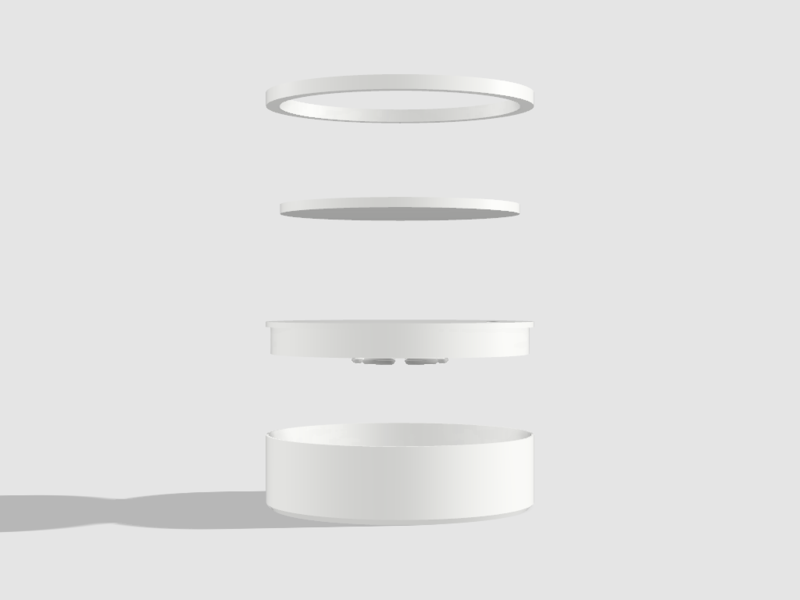 The electronics holder, the cover, pressure plate, and plate ring. The electronics holder holds everything together and houses the arduino and battery. The cover has small sections coming off of it upside down to hold the LED's and vibration motor in place. 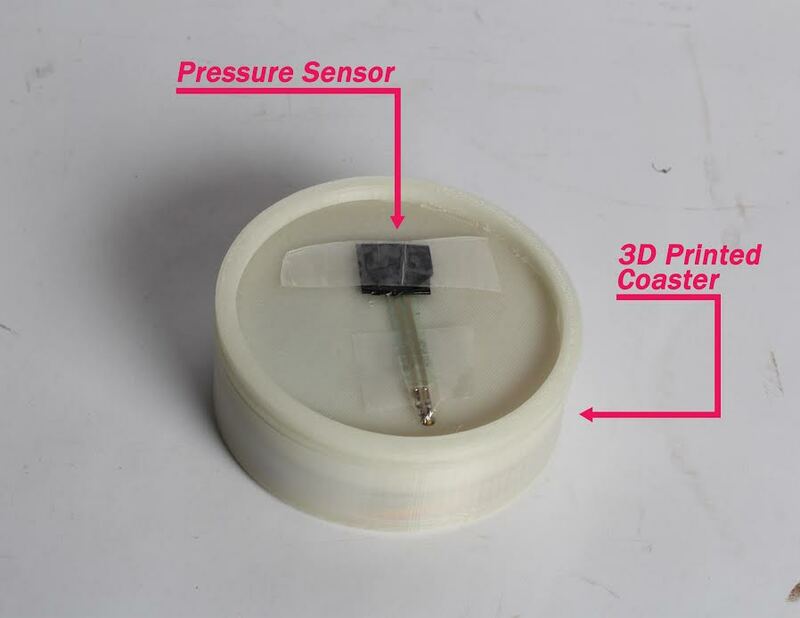 The pressure plate pushes down on the pressure sensor evenly so that it will give a good reading everytime a water bottle is placed on it. The plate ring holds the pressure plate in place. Putting it together proved to be a bit difficult, but all of the components fit fairly perfectly. The way its designed, there are no wires or black box outside of it making it a sleek, self contained unit. We created a smart coaster for people to use on a daily basis. A big part of your health and wellbeing is drinking enough water regularly throughout the day. In order to solve this problem we made the H2cOaster. When you place your water bottle onto the coaster, it will start a counter. 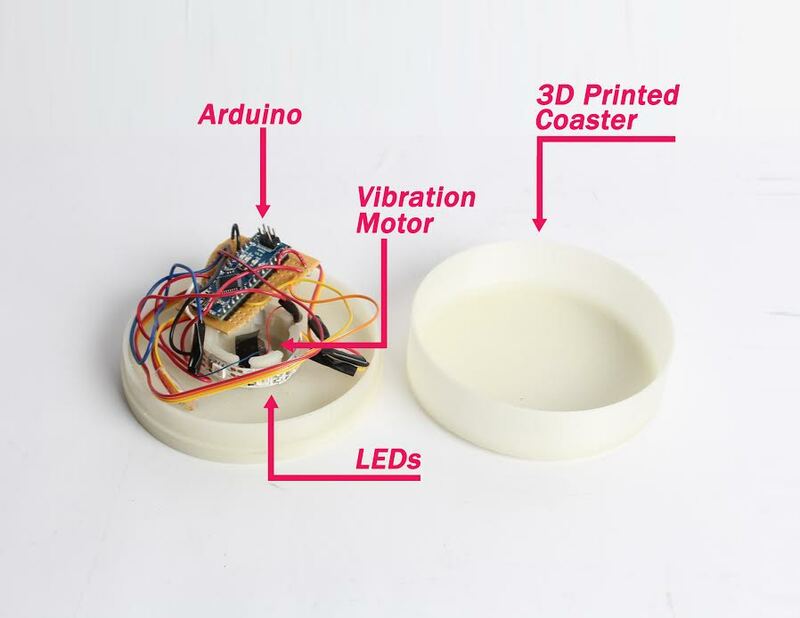 After 15 minutes is up, the coaster will light up and vibrate indicating that you have to take a sip of water. If the bottle isn't picked up it will continue to vibrate and glow until you take a sip. After the water bottle is put back on, it will restart the counter. Once you have depleted all water from your water bottle, it will notify you again, but this time the user will be signlaled to take break from what they are doing and refill their water bottle. Hopefully, this will encourage them to drink more water and make a habit of doing so. We created an experience of floating dodecahedrons. We were inspired by Tai Chi with its slow motions and movements allowing the body and mind to be in sync with each other. We wanted to simulate this experience but for an everyday person who does not practice Tai Chi. We did this by creating dodecahedrons that have lights inside. A light turns on and the user has to slowly move their hand towards that dodecahedron to turn the light off. The light slowly fades as the person gets closer to the dodecahedron. 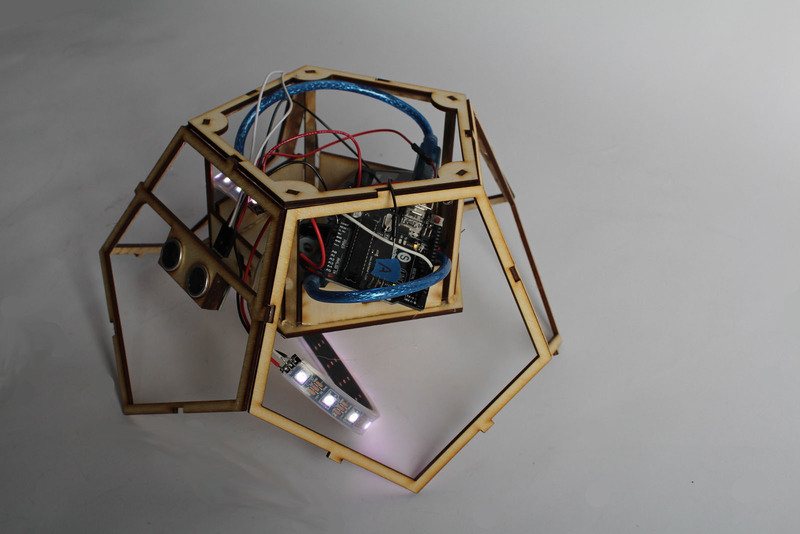 We made the dodecahedrons out of laser cut balsa wood and all the light and sensor work function with an Arduino. The dodecahedrons have a wooden frame on the inside and the panels are woven together with white thread. We started off the studio by doing some basic Arduino tutorials. When it came time to group up, Julia and I decided we wanted to work together and started to brainstorm ideas. We knew that we wanted to make something that was interactive and more of a whimsical experience, as opposed to a device. We used Tai Chi as our inspiration. Tai Chi is a meditative practice that involves body movements and the repetition of physical patterns. All the movements are very slow and controlled. Tai Chi helps you become more centered and aware of your body, increasing your wellbeing. 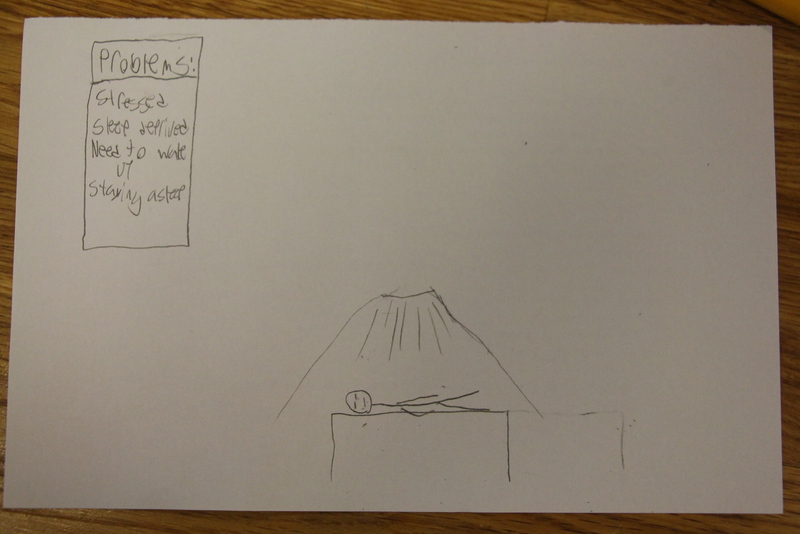 We started off by thinking about our project as a stand up twister game with lights on a cat toy-like structure. As the lights appear, you have to cover them with your hands and feet to turn the lights off. The user is forced to cover the lights very slowly or the light won’t go out. Once one light goes out, the next one will light up. We want the user to turn the light out by moving their hand or foot towards the light and keeping their hand or foot there until the next light in reach opens up. Our project promotes slow and controlled movements of the body which will help the user become more aware, thus increasing their well being. Our ideal structure was going to be similar to a cat scratching post toy, and be very long and have protruding branches going off it. For prototype's sake and ease of making we are starting off with boxes that have stands or can be placed on a shelf. Our plan is to have one low box at foot level, one high box that you would have to stretch to reach and one mid height box. The lights will be in different places for each box, some on the top of the boxes and some on the sides, ensuring that the user has to reach and stretch to cover the lights. 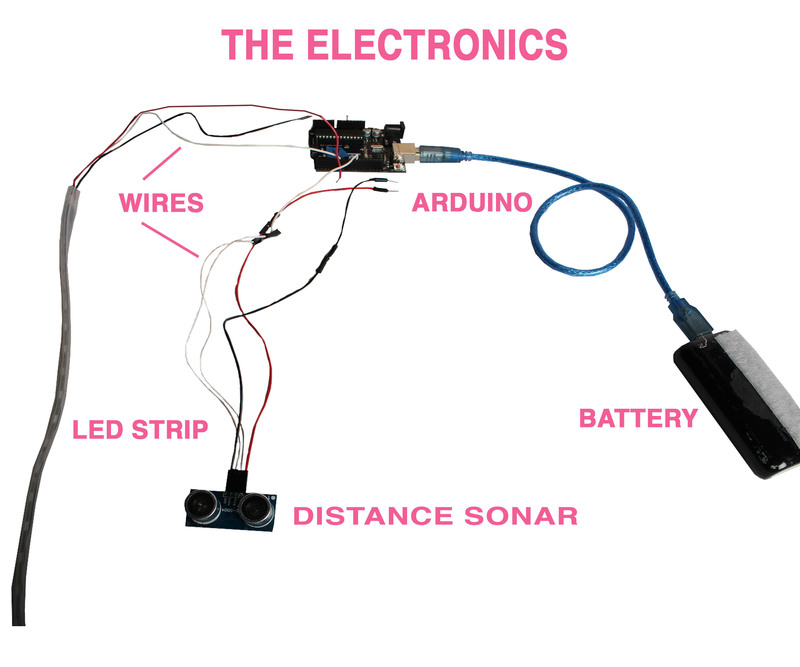 We started working with an Arduino by getting a sonar sensor to work with a vibrating motor. We used a sonar sensor to judge the distance. Once we got it working, we then switched the vibrating motor out for a LED strip and fixed the code to make it work with a light. The final result made the light glow and fade. We also made a cardboard box as a prototype to test out the heights of the boxes. We looked at Tai Chi poses to determine where we wanted the lights to be and to see what body movements would be most useful for our project. We tested out the heights and felt confident they would work for most people. The box was ugly. We thought about ways to make it more aesthetically pleasing. We wanted the light to be able to fade instead of looking like a light, and we wanted a glow. We first considered having a wood box inside of a clear box so that the light would have more room to defuse. We decided that was simply a bad idea because it would look stupid and not be any better than the box we had before. We then decided that we wanted to use balsa wood. That way we could maintain the organic Zen feel. We went out and got the thinnest balsa wood we could find. 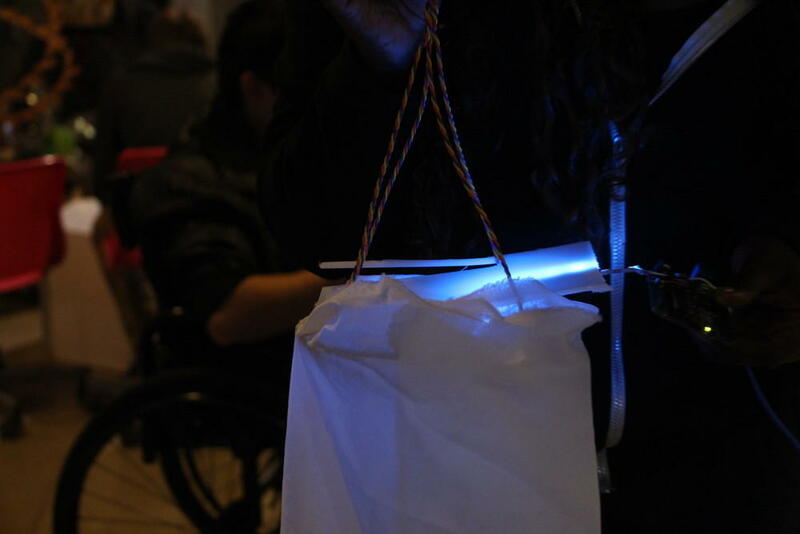 We tested the lights with them and they worked well, although the light didn’t defuse as much as we would have liked. We then sanded down the balsa wood and it looked much better. The whole strip of wood started to glow with the lights and was very beautiful. With the basic Arduino work done and the concept secured, we started working on the design. We had originally thought that the lights would be housed in boxes on stands. We had made a box earlier, but decided that that was not the look we wanted. We started brainstorming on different ways we could house the lights that would make the concept stronger. We decided that we wanted to create an experience and start a conversation between the user and the project. We wanted each person who experienced our project to feel like it was personalized to them and that they were experiencing something unique. We thought of going to do this by having the light pieces be almost like toys, where you could build your own structure and make it fit your body and your mood. We came up with a few different ways of doing this using connector pieces and bars. We decided that it was not the feel we wanted. We didn’t want our project to be experienced as a game and building project, as that would take away from the experience. We also didn’t want our project to turn into a closed space. We didn’t want bars and poles holding it together. We thought of a new way of having building blocks where the light pieces snapped into each other, but we realized that this had the same problem of creating a closed space. We then stumbled across the idea of hanging the dodecahedrons. We could hang each of the light structures from a main structure that you could walk underneath. That way it creates a space but does not close you off from the world. It creates an open experience. We knew that we still wanted maximum customizability of the space depending on the person in it. For each of the light structures you can change the position of the light in the x, y and z direction, allowing for maximum customizability. 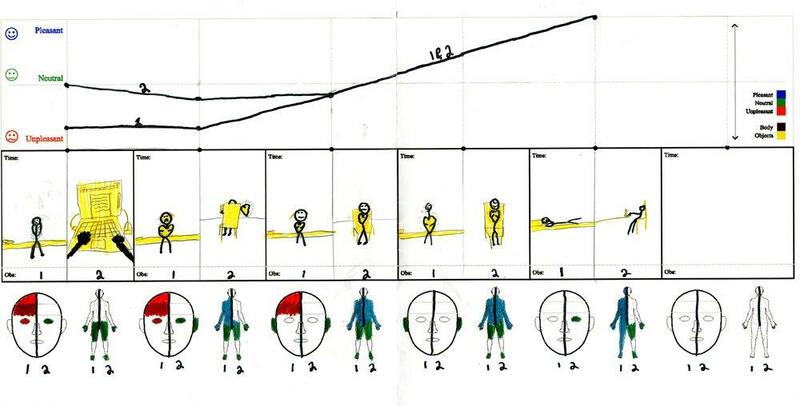 We also decided that it was useful to use specific Tai Chi moves and take that into account in our design. We plan on having notches where the light structures naturally fall that will lock them into certain positions that are desirable for Tai Chi. Through our research we found that the majority of the Tai Chi moves have the arms either at shoulder level or hip level, and we can incorporate that into our design. We worked on the housing and the shapes of each light fixture. We originally made a sphere constructed of cardboard triangles just to test with the materials and start making shapes. We decided that the sphere made of triangles had too many faces and was too complicated. We also tested the balsa wood and decided how we will be putting it together. We laser cut the pieces of balsa wood with holes along the edges and sew the pieces together. This offered an organic feel. Once we had figured out how we were putting it together we took a step back to look at the shape. We decided that we would rather use a dodecahedron, made out of pentagons. We thought this was better because it had more faces and each face had five sides—like a hand. We started experimenting with building a dodecahedron and started making a frame and the sides. We needed an internal frame so all the weight of the Arduino and battery wouldn’t be on the balsa wood, because the balsa wood can’t support the weight. The frame for the dodecahedron is made out of thin plywood. We spent a morning prototyping the frame. We had to build a few different frames in different sizes to get the best fit. When we made the frames, the sizes were unpredictable because we couldn’t always put the frame together the right way. After making a few frames and testing it, we decided that we didn’t need a whole frame. The balsa wood is sewn together and holds its shape. Since the dodecahedrons are going to be hanging, there was no point in building the bottom half of the frame because it won’t be used for support anyway. However, not having a bottom to the frame means that once the dodecahedron is done, it will absolutely not be able to sit and rest on its own and will always have to be hanging. The weight of the frame will crush the balsa wood beneath it. The frame is made with six sides to it, and a table hanging from the top piece. The top piece is solid and will be taking all the weight. All the other sides are just on the edges of the dodecahedron. One of the sides of the dodecahedron has a special side that has a hole for the distance sensor. 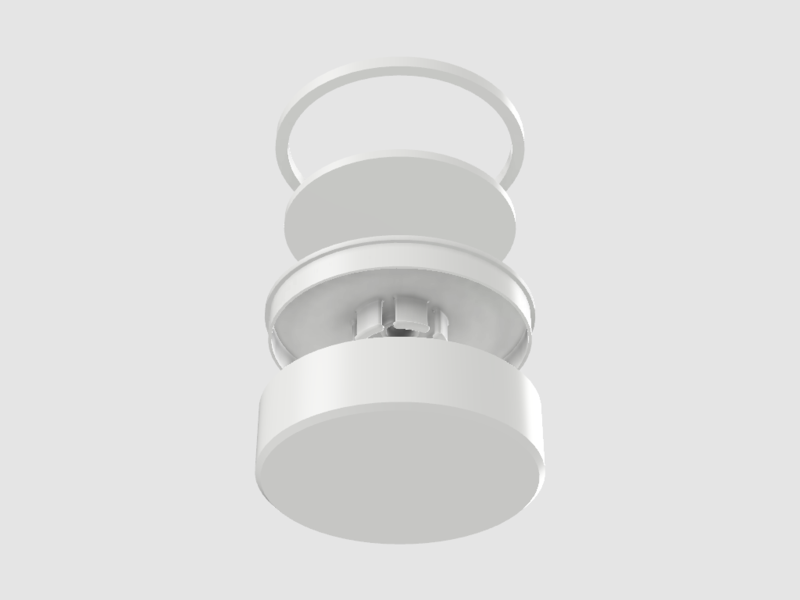 We decided that we only want one sensor per dodecahedron, because the lights look much better if it lights up the entire dodecahedron as opposed to just a side of it. 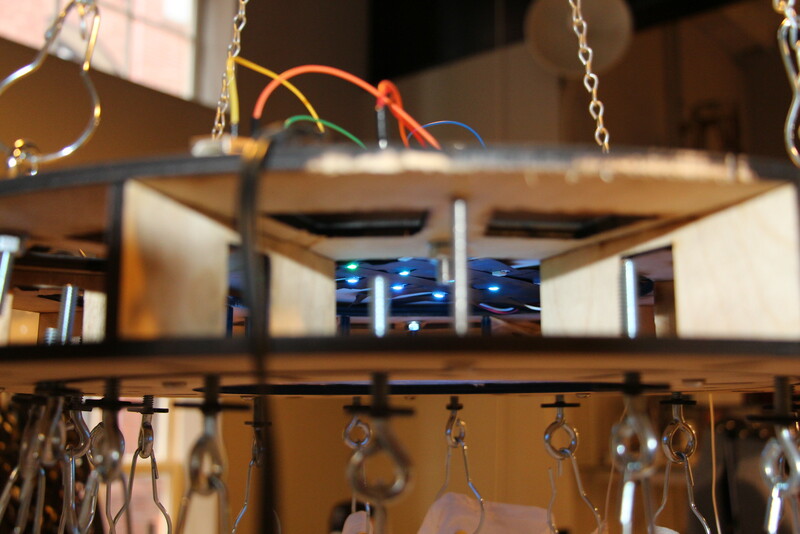 Once we had the structure and frame worked out we took one last look at the Arduino portion of it. We had the code working before but it was an overcomplicated code for a very simple command. We re-did all the Arduino and to make it more simple and effective. 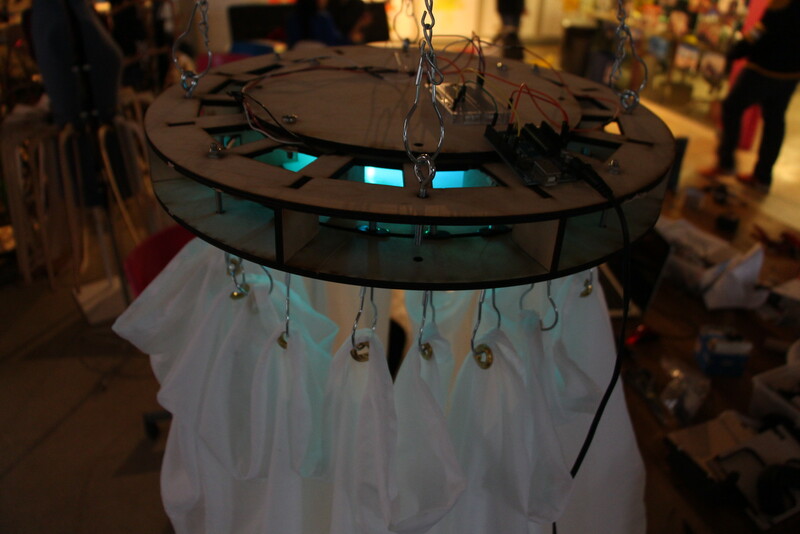 Once we had the design and Arduino out of the way, all we had left was manual labor in making the dodecahedrons. We made the frame, soldered all the wires and assembled our first dodecahedron. The tricky aspect of assembling the dodecahedrons is half of the dodecahedron needs to be sewn together while it’s hanging so that it doesn’t get crushed in the process. It’s tough. In the end, we finished about 1.5 units. We made the frame for the second dodecahedron and sorted out all the electronics. It is looking great! In Products for Wellbeing, the goal was to create items to help increase the happiness and healthiness of people around the world. Our group’s goal was to create a product that helped increase people’s wellbeing by emulating the experience of hugging a pet, specifcally a dog. Dogs are always happy to see their owners. Lying in bed at night, it is so comforting to feel their body heat and heartbeat. 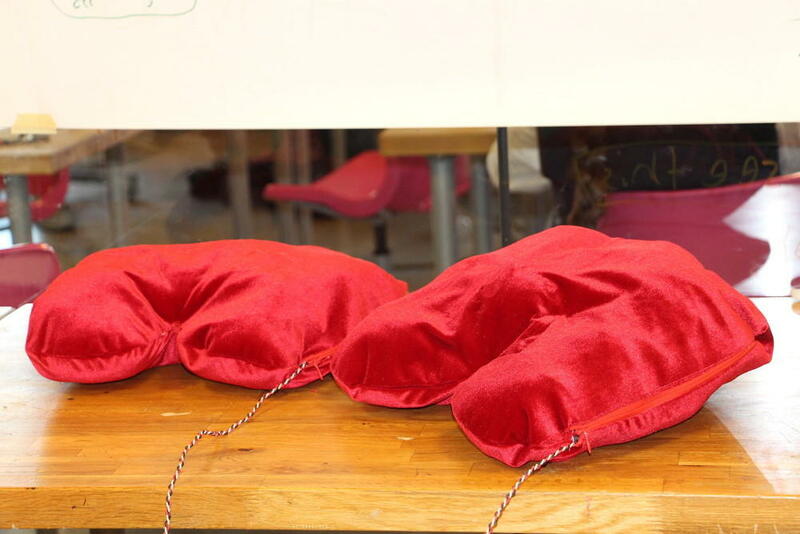 For our project we created two soft and furry heart-shaped pillows to imitate animals. When a person hugs one pillow, the other pillow will pulse like a heartbeat and vice versa with the other pillow. Many people have busy, stressful lives and do not always have access to a pet or another person to calm them. Our project is important because it will help people by simulating hugging and allow people to feel a steady heartbeat and get their stress to manegable levels. The harder you hug the pillow the faster the other will pulse. This is nice because one person can feel the other person’s effort. The pillows are soft and cushiony and the pulsing creates the illusion of a heartbeat. If we had more time or planned to expand our product we would have added heating pads so that they also get warm when you hug the pillows. We hope the pillows will relax people, lower their stress and help them feel calm in their everday lives. hi esther, you should change the ownership policies for this post to allow me and oliver to edit. go to the settings where you can edit a post and click ownership/privacy. enter our names into the left side of what comes up and it should work. email with questions.